To add new posts or edit existing ones, you need to go to the Dashboard. You can get to the Dashboard by hovering over My Blog on the very top navigation bar. Hovering here reveals a drop-down menu & you click on Dashboard. 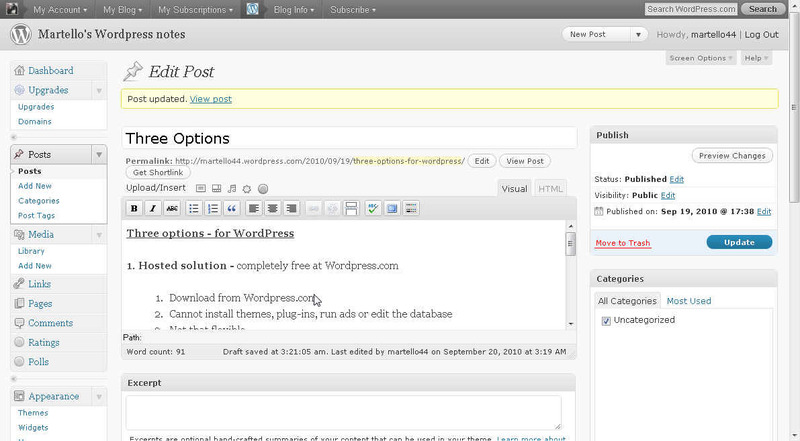 In the Dashboard, new posts are added by using the Posts section on the left & clicking Add New. This action takes you to the Visual Editor which has a familiar editor’s look much like any word processor would. Take note of the typical tool bar at the top: Bold, Italic & bullet list icons which reveal text when hovering over them. One of the more interesting icons is the More icon which is to the left of the ABC spell-check icon. The More icon is used to break up a long post so that a visitor only sees content up to where the More icon is placed & has to click the More link to see the rest of the post. This entry was posted in Dashboard, Editing post, New post. Bookmark the permalink.